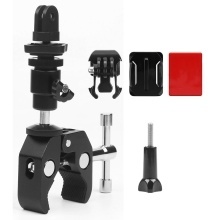 This versatile mounting bracket with universal 1/4 inch screw, can be fixed your camera to guns, bows fishing rod arrow. Suitable for diameter of 10mm to 55mm of the barrel, the rod handle and bows components. Compatible with most firearms and fishing rod. Note: Accessory only. The camera, housing case are not included.